George Osbourne's speech at the tory conference laid down the reasons for an additional £10 billion cut in benefits spending that are needed to get to the heart of Britians benefit culture crisis that over the last Labour government's regime has resulted in a state where those out of work can receive more in benefits than those in work earn that has contributed towards Britians accelerating trend towards bankruptcy. Britain's topsy turvy tax and benefit's system is designed to over time turn virtually everyone into benefit claimers given the increasing disincentives to work and incentives not to work, to date the coalition governments reforms have just furthered the progress of the benefits state by penalising the middle class as the child benefits cut illustrates, which in reality is not a benefit at all but a partial tax rebate for families. Britain's £180 billion benefits culture WILL eventually bankrupt Britain, or rather IS bankrupting Britain as evidenced by Britain's ongoing stealth debt default by means of high inflation (real rate above 5%). The peoples of the rising eastern economic super powers are laughing at Britain when they hear that the UK pays millions of those that could work to sit idle at home, acting as a huge drain on the economy. The weak coalition government is belatedly attempting to address the benefits culture crisis, but it's focus on hitting those already in work has been all wrong, instead it should have been increasing the incentives to work by cutting taxes and benefits rather than raising taxes which is what the Child Benefit cuts ultimately are i.e. a tax hike. Iain Duncan Smith and I are committed to finding these savings while delivering the most radical reform of our welfare system for generations with a Universal Credit so work always pays. Because it's not just about the money - it comes back to fairness and enterprise. For how can we justify the incomes of those out of work rising faster than the incomes of those in work? How can we justify giving flats to young people who have never worked, when working people twice their age are still living with their parents because they can't afford their first home? How can we justify a system where people in work have to consider the full financial costs of having another child, whilst those who are out of work don't? And here's the broader point. How could a country that wants to compete in the world economy possibly explain that it's cutting budgets on things like schools and science because it couldn't summon the political will to control welfare? For in this country we face something even greater than recovery from recession and the problems of the past. We face the shock of the future. Something my great friend William Hague talked to us about yesterday. And what a brilliant Foreign Secretary he is. The economic crisis has accelerated a change that was already happening in our world. Prosperity and the power it brings is shifting to new corners of the globe, to Asia and the Americas and even now Africa. I'm proud of our commitment to international development but the truth is that free enterprise is lifting hundreds of millions of people out of poverty more quickly than all the government aid programmes of the world put together. That's good news for them, and good news for us too, as it creates vast new markets for British exports. But only if we rise to the challenge. Western democracies like ours are being out-worked, out-competed and out-smarted by these new economies. The question for countries like Britain is this: are we going to sink or swim? ... they'll become poorer and poorer. I am determined that will not be the Britain I leave to my children, or you leave to yours. Under the Labour government, the benefits culture had gone completely out of control where people were rewarded for NOT working. The benefits culture where the aim exists to maximise benefits received by permanently non working parents by means of increased number of children who themselves will go on to perpetuate the self same behaviour of their parents and grand parents has dire implications for Britains future as the money for nothing generational benefits class that has no inclination for work has continued to grow far beyond the rate of the working and middle classes, therefore has lead towards an escalating unproductive tax on the UK economy. As the number of children born into the working and middle class averages less than 2, whilst the number born into the benefits class numbers more than 4, which given the fact that there is little incentive to educate will eventually lead to the dumbing down of society and a drain on future productivity. Despite 10 Years of debt fuelled Economic Boom into the End of 2007 the Benefits Class had continued to grow relentlessly and now totals more than 8 million of those of working age against the working population of 28 million (29%!) as the Labour government had succeeded in creating a dumbed down voter pool that they can march to the voting booths at each election, however it has sown the seeds for the further destruction of civil society both in terms of monetary costs and soaring crime rates as we have seen the consequences of in numerous news reports of feral youth roaming the streets intent on crime and vandalism as those on benefits have children that they have no real intentions of raising into productive members of society. I have touched on the economic consequences Britains' benefits culture many times over the year and is illustrated by the below graph of what Labour did during its 10 years of social engineering (22 Apr 2010 - Real U.K. Unemployment is 5.5 million, the Jobless Economic Recovery?). During the Conservative boom cycle, real unemployment fell from the 1983 crisis high. However the same did not take place following the early 1990's recession where real unemployment failed to not only fall but steadily rose under Labours boom years as the benefits culture took hold and hundreds of thousands of foreign workers performed the jobs that unemployed Britain's were not prepared to do as they were far more comfortable living off the tax payer in Labours benefits culture. Whilst not all of the 8.16 million economically inactive should be seeking work, however the figure does imply that at least 3 million of the 8 million form the core of the the benefits culture. Therefore the 3 million that choose not to work but instead prefer to rely on tax payer funded benefits added to the official 2.5 million unemployed results in a total UK unemployment count of 5.5 million. Which is more in line with the recession experience of other similarly in-debted and structured European countries such as Spain that has an unemployment rate of 19%. George Osbourne's announcement for cuts of £10 billion in the annual benefit payments is on the right track of trying to socially re-engineer the country in favour of productive work rather than the culture that seeks to maximise the amount of benefits that can be claimed at the expense of ANY productive activity. Benefits should be capped at 33% of average household earnings approx £12,000. - Coalition cap is £26,000. Benefits should be capped to a maximum of 3 children to ensure responsible parenting. Those out of work should be actively seeking work. Compulsory national service to instill discipline and the work ethic in the youth. Those out of work for more than 1 year should be forced to work for benefits. The greatest victims of Labours benefits culture are not the hard working tax payers that fund benefits life styles but rather the permanent benefit claimants themselves for it results in wasted lives, we only get one chance at life! Another insightful article, which is much appreciated. However this time I think you are losing the plot a tad. "Compulsory national service to instill discipline and the work ethic in the youth." Why not "compulsory training in much needed practical skills to instill a work ethic and allow young people to become economically self sufficient - maybe even entrepreneurs"
We live in a Capitalist system in which periodic crises are an integral part. Wouldn't it be more mature to recognise this fact and appreciate that, because of the nature of the system, people will be idle - the vast majority (yes, the VAST MAJORITY) unwillingly, and provide these people with a modicum of human dignity and resource to function as part of society. Surely an educated person would count this as part of the cost of the system. To fail to appreciate this fact is at best ignorant - at worst callous! Let's have a bit more focus on the "too big to fail corporations who suckle on taxpayer largesse massively, and less on the "too small to give a stuff about" victims of the system, of whom there are genuine millions. compulsory national service would act as shock treatment to instill discipline. The problem at the heart of Britains economic crisis is not debt or even the banks and corporatins, it is that successive governments have whittled away the incentive to work to arrive at a position where 1/3rd of those of workign age do not work. Throw in the growing number of pensioners and we are heading towards a collapse of the system Greece style when everything just stops! Do we take small amounts of medicine today or do we wait to wake up to being Greece? Because at this rate we will be there within 5 years. 50% of the economy is public sector, to get incentives to work / start-up businesses, government spending, taxes and red tape need to be cut, urgently! Else the market will force the change on us, painfully! Some very good points Nadeem. However, I don't think the Liberal Democrats will fully support the idea, as it will cost them seats in marginal constituencies with Labour. I think it is just party conference posturing. I have witnessed the sociological impact of the benefit culture, and it is not good at all. The National Service idea has some merit, but I would be concerned that with the big cuts to the armed forces, they would be used in some capacity, in the next unjust war our government gets involved in. There has to be safeguards to this, then the idea will work. Are EU citizens allowed to use our welfare system? If that is the case, then there may be an even bigger problem over the next few years. Also, I didn't see one party conference mention cutting back on foreign aid. They all seem content to funnel money into the Swiss bank accounts of corrupt politicians, at the expense of their own people and us the taxpayer. Unfortunately it appears that is the price being paid by Britain for avoiding a third war with germany. Similarly the Germans are paying a price for avoiding a war. "compulsory national service would act as shock treatment to instill discipline"
Why do you presume discipline is the problem? Why do you presume a spell in the military is the solution? Have you, or any of family, ever served in the miltary? Have you ever been unemployed? Now I say, I pay my taxes and rather than spending them to train young people to fight, I want it spent teaching them how to build me a house, or mend my broken tap, or fix my car so they can support themselves and their families. Seems like common sense to me. Likewise I would say, tell an idle person you are going to provide them with training in a skill that is useful and profitable then that will be enough incentive. Once trained , they can then sell their skills in a free market. What do we have instead - we have a "neo-speenhamland system" where people provide free labour filling shelves for big corps. Is this part of a Capitalist system? No, it isn't! "The problem at the heart of Britains economic crisis is not debt or even the banks and corporatins, it is that successive governments have whittled away the incentive to work to arrive at a position where 1/3rd of those of workign age do not work." No - the problem for the working class is that successive governments have conspired to massively increase the labour supply through immigration and other anti-family measures so that there is a massive oversupply of labour - and those who caused the problem don't want to pay for it. As for your comment on debt - well, having worked for a long time in the City, and even one time had to endure a pre-crash lecture soft soap from a CEO of a mega bank , I must suggest you are wrong Nadeem. I am referring to those that choose benefits as a way of life, who NEVER work from cradle to grave! The evidence for this is in the real unemployment graph above that shows despite labours boom years real unemployment rose. National Service - I am referring to distilling discipline in the youth say 18 or 19 year holds doing 6 months National Service within this countries borders. Immigration - Is a function of many things one of which is Britain's benefits culture. I stand by my conclusion that socialism is at the heart of britians econcomic crisis be it for the poor or the middle or the rich, socialism is what kills economies for it creates disincentives to work. "The evidence for this is in the real unemployment graph above that shows despite labours boom years real unemployment rose." You may like to compare these figures with the huge influx of EU entrants there were into the U jobs market. Basic O Level economics supply and demand informs that the result, if not the purpose, would be to lower real wage levels. I still wonder why "National Service". Would you not accept my point that more could be achieved, with a more productive and positive outcome, by actually training people to acquire skills that would enable them support themselves and their dependents. Have somebody get them out of bed at 6 a.m. and give them natty uniforms if that floats your boat, but at least at the end of their time they may actually be able to do some work that would enable them to become independent. The big question, surely, is WHY NOT? "I stand by my conclusion that socialism is at the heart of britians econcomic crisis be it for the poor or the middle or the rich, socialism is what kills economies for it CREATES DISINCENTIVES TO WORK." Is this why Corney and Barrow are still busting to the seams over very long lunchtimes with our financial friends, spending more on a bottle of bubbly than an unemployed family receives on benefits to get by per week ? 13 Oct 12, 14:26 EU Migration, Work and benefits culture. Globalisation means average wages are converging, in the UK falling and in the east rising. That IS the MEGA-TREND. Workers are migrating here because the politicians signed the UK up to the EU single market, I did not understand their logic either other than it helped support Labours benefits culture voter pool. Basically the benefits culture encourages laziness, national service incourages discipline and the work ethic, you need a base upon which to build the rest i.e. other skills, if people cannot wake up at 6am and be prepared to work until 6pm then no amount of training will work. Again your missing the point of Real unemployment which is that Labour encouraged millions to stay on benefits so as to create vested interests who would vote for them to retain benefits. The bailout of the banks was socialist, as I stated at the time they should have been allowed to go bankrupt, that would get the pain out of the way quickly rather than to die a slow economic death via inflation stealth default that benefits the rich i.e. the rich have first call on inflation through leverage. 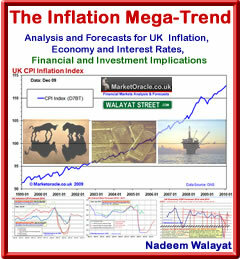 I will do indepth analysis of unemployment as part of the housing market analysis. But the bottomline is that Britain is sliding towards Oblivion, we need to do something today to turn Britian into a lean mean econcomic fighting machine, else we WILL GO BANKRUPT! When none of this will matter, because the money given to benefits claimants and workers will be worthless, as the Iranians are finding out. Just to go off point briefly, what would be the economic outcome for the people of Scotland, in the unlikely event they vote for full independence? Probably somewhere between Ireland and Greece. The problem is socialist tendencies that would run amok, i.e. print debt that no one would want to buy. All that with the same flaw as the euro-zone in that the SNP has stated that they would continue to use the British Pound, so would not be able to set interest rates or print money. An independant Scotland would only eventually work if it were as capitalist as South East England / Ireland with its OWN currency. And even then there would be pain associated with a small new weak currency that would see very high inflation of at least 15% per annum, which means most scots would keep their cash in sterling instead of investing in scotland, which would benefit England. You obviously had a genuine reason for being on benifits and may not have acheived the £26000 cap and got meagre handouts and looking at this argument from an emotional view point. But others do get the £26k cap and that is a problem and £12000 is more then reasonable, there are guys out there working for far less. Infact around 5years ago I got much less then this. Also if I'm looking to rent in South Kensington, I simply can't because I can't afford it. Yet there is an outcry when claimants are asked to leave high rental areas based ON SOCIAL INJUSTICE. No one talks about the social injustice of the hard up workers having to choose gangland type accomodation due to affordability. Also there is no better incentive to work then hunger itself, and Nedeem is not even saying that, he is simply saying cap it at £12000. Also as long as the national service is within UK borders purely for defense (lol they can even be used to find illigals if that floats your boat) then that will work. Training is not the problem, infact many of these yobs are highly intellegent, I've met many and their knowledge of how to scam benifits is second to none. They often drop out simply from getting a strong word from the boss and going sick when they couldn't be bothered to work, their reaction is often more of an underlying violence towards their boss then stepping inline. This is how they were brought up and its in their DNA. No amount of training will fix this as Nadeem stated. This is a discipline problem. To opt out of the national serive at the age of 18 or 19 is to forgo benifits, this will ensure civil liberties are not violated and there should always be a choice of freedom, this will also provide an incentive to do the national service because a 6 month stint in exchange for a lifetime of benifits will get them to take part, hopefully we can change them enough while still young.